Dermal Needling (Collagen Inducing Therapy CIT) is a skin rejuvenation treatment that helps restore and accelerate the skins own regeneration of collagen and elastin via tiny microscopic wounds and allowing he body to heal via its own natural restoring process. These tiny microscopic wounds maximise the release of natural growth factors, eliminating the risk of pigmentation injury seen with some laser treatments. 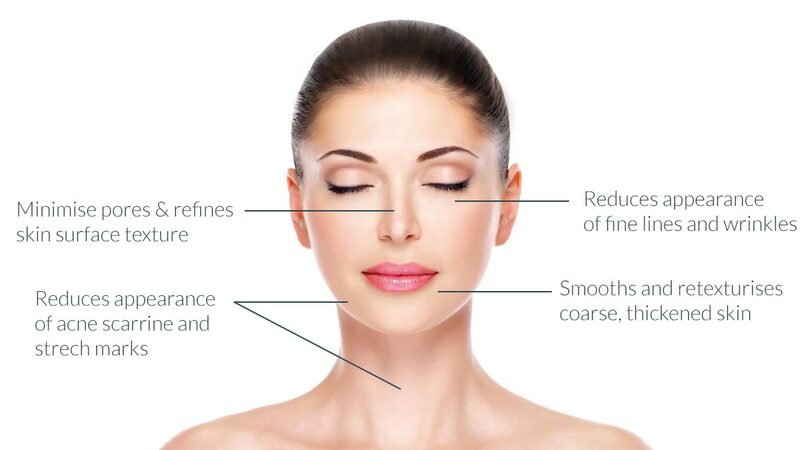 Dermal Needling can be performed on the face, neck and décolletage. It is a great treatment for acne scars and stretch marks. It is also recommended for improved skin tone and texture from photo-ageing. What are the benefits of Dermal Needling (CIT)? A topical anaesthetic is applied to the treatment area for total comfort and relaxation. A pen is brushed over the skin multiple times, to induce tiny perforations over the skin. Depending on the area treated will depend on the amount of time required. A minimum of 24 hours downtime can be expected with skin feeling dry and flushed for up to 10 days. Depending on your skin type, treatment plans are tailored to suit your needs and your desired results. Results can be seen after 1 treatment, however typically, a series of 3 treatments spaced 4-6 weeks apart are required for optimal results. For treatment of deep wrinkles, advanced photo-ageing, stretch marks or acne scars, a series of 6-8 treatments at 4 weekly intervals is usually recommended.